This is the travelog of Michelle and David during their short break to Chinchón near Madrid in Spain. 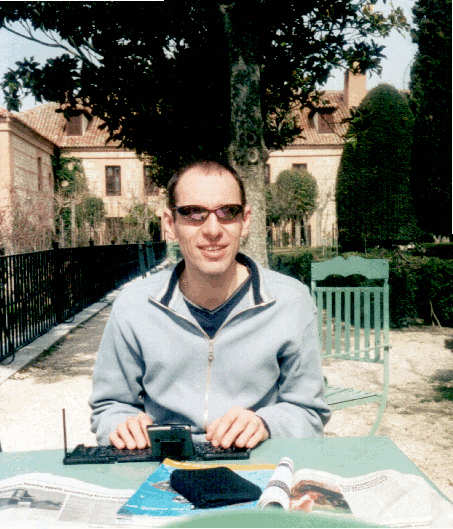 The travelog was written every evening using the Palm m515 and incredible folding keyboard. Got up at 4am. Last night we took all three children to their grandparents and today Michelle’s surprise for my forthcoming birthday will be revealed. I have managed to work out that we are going away without the children for three nights. But I don’t know where. I know we are flying - Michelle has received an email from EasyJet and she recently panicked (and tried not to show it) when I told her that my passport was about to expire. I have tried to work out where we are going. I have previously told Michelle that I fancy going to Ireland. My Dad went fishing there when my brother and I were very young, and he often said how he enjoyed it. But an Irish friend of mine told me that you can get in without passport - with a Tesco Clubcard! So its not there, as the passport panicked her. If it was France or Belgium we would go by Eurostar train, so not there. She might pick St. Petersburg (where one part of my family came from), but the clothes she told me to pack aren’t warm enough. So not there either. From my ideas of the sort of places she would pick, that leaves Scotland, possibly Inverness, not enough warm clothes again. That leaves Spain, possibly Barcelona, or as an outside bet somewhere in Italy. My bet is Spain. We drove to my brother’s house and he and my sister-in-law very kindly took us to Luton airport. Poor thing my sister in law didn’t look to well. Bless her for taking us. They are very kind. At the airport all was revealed when we joined a queue for the Madrid flight. I was feeling very smug having almost got my guess right. The flight was OK. We sat next to a plane spotter, who got lots of numbers for his little book. At Madrid airport Michelle took me to the car rental stand where we got a nice car that was included with the accommodation. Then we had a 45 minute drive to town south of Madrid called Chinchón. 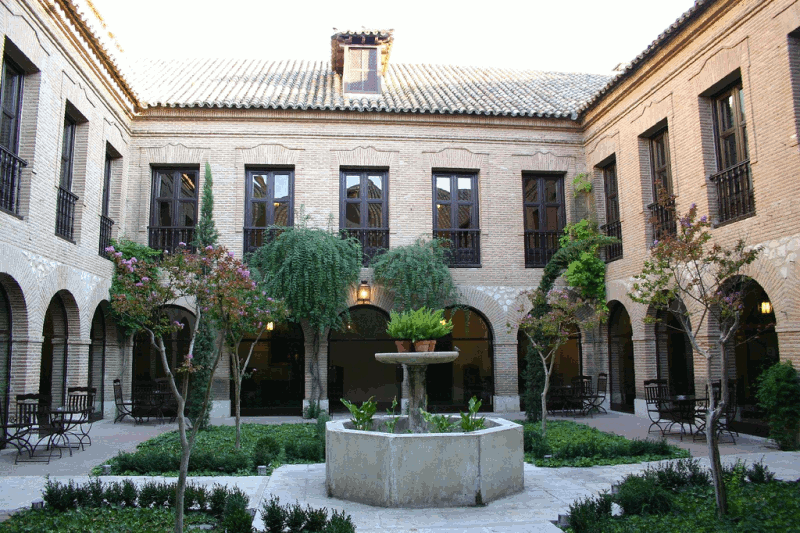 Here we booked into a beautiful Parador. These are Spanish Government owned luxury hotels in historic locations. In Chinchón this was in a beautiful 15th century Augustinian Monastery. It all looked very pleasant. The room is spacious with a pleasant view of the Monks vegetable garden. The room is furnished in keeping with the Monastery. It has a sparse feel, while having all the usual hotel room facilities. All in all it is quite delightful. Once we booked in we went into the town square. This is an Elizabethan looking area. Perfect for film sets. It has high buildings with galleries overlooking the square. It is very different. We went to a tapas bar and randomly picked some dishes. In some cases we knew what the dishes were, in other cases we had no idea as our Spanish isn’t as good as our French. The food was good. The weather was surprisingly warm whilet we sat out in the square. Next we returned back to the room and collapsed for a two hour snooze - we were both tired after an very early rise. Later we had dinner in the hotel. The food wasn’t quite as good as the setting, but it was palatable. When we returned to the room the bed had been remade and our bed clothes beautifully arranged on the bed. A pleasant and relaxing day. Michelle was worried if I’d like what she had arranged. There was never anything for her to worry about, because I know the time and trouble that she went to in order to arrange it. So no matter what, I really appreciate it. In the event it is delightful as well. So I'm absolutely thrilled. We have never travelled on the low budget airlines before but the experience proved quite pleasant. The plane was cleaner than scheduled European planes although the food and drinks are expensive. David hates flying, but after his NLP 'treatment' he did seem less apprehensive than on previous occasions. I am always very sceptical about these quack cures. After arriving at Madrid airport, we collected the hire car and painfully navigated our way around Madrid. An hour later we arrived to the sparse hills of Chinchón, a tiny town 55 kilometers (30 miles) from Madrid. We are staying in a Parador which are government run establishments. Many of them are disused and converted palaces, castles, monasteries, convents or are built in a traditional style in places of historic interest, more often than not of the beaten track. Parador de Chinchón is a converted monastery, that has been carefully restored. I do think that the interior ecclesiastical origins are relatively subtle apart from the domed and beautifully painted ceilings. There is a swimming pool but it is only usable during the summer. The gardens are carefully maintained apart from a very murky pond and lots of heavy scents. I couldn’t ask about the flowers because most people do not speak English and my Spanish is worse than my French. A nice long sleep in a large bed, undisturbed by children or the infernal alarm clock. A wide selection of food is served for Breakfast. We drove into Madrid which is, as expected, a bustling city. We parked at Plaza Mayor and walked to Parque del Retiro. We had a drink opposite the very striking Monumento a Alfonso XII. A short stroll outside the park was where we had lunch. Incredibly cheap, but not too appetising. We took the tube back to the car. Next we drove outside Madrid to Toledo. This is a wonderful town. Full of character. On the hill is an enormous imposing building called the Alcazar that would not look amiss in Dracula. We did not discover what the building was. Nearby is the externally unimpressive cathedral. Inside the building is extraordinary. The ceiling especially. It is slightly spoiled by the artifacts in many of the bays. Several are in dirty and in poor condition and have a seaside museum feel. In my amateur opinion only one or two were really of fine artistic merit. We decided to try and follow a walk from a tourist guide that we had. There are times when the skills that I learned while in the Scouts really do help, and now was such a time. Toledo itself is full of old buildings separated by steep narrow passage ways and small squares. Exploring them seemed great fun and getting lost is very easy. Because it is very easy, we are very good at this and soon we we utterly lost. We were soon tired, hungry and weary. Unlike France, we know virtually no Spanish, so asking someone for help was useless. No way of saying we are lost, or where is. Even if we could do that how could we understand their directions. We were very despondent. Quickly this beautiful and historic town started to look like a hideous maze of desolate passageways. I tried starting to sing walking songs. The sort of thing that I used to do when hiking with the Scouts. It kept my spirits up, but Michelle didn't appreciate it! There are times when the skills that I learned while in the Scouts really do help, and now was such a time. Using some landmarks and the shape of the valley in which Toledo sits, helped me to eventually find the car park albeit after too long. As we drove out of Toledo, we admired it by dusk and talked wistfully of returning again one day, perhaps even staying in a Toledo Parador hotel. Little did we know that our ordeal wasn't over yet. We followed the N400 road towards Chinchón. Suddenly the signs disappeared. We occasionally saw CM4000 but nothing saying N400. The road was long, unlit and devoid of road signs. After about 25 miles we saw a sign which rang alarm bells. We were lost. After a bit of map reading (good job I always insist on taking my compass on holiday) we turned round and drove that 35 miles back down the same road that we came up. When we go back to Toledo, we found N400 signs and followed them. Again after 10 minutes they disappeared. This time the compass said we were heading in the right direction so we kept going. Time was passing, it was getting late. We were both very hungry and started to worry if we would get back before all the restaurants closed. The thought of going to bed really hungry with no food available until the morning was not attractive. Eventually we found our way back, and had something to eat. Eating in Spain is unusual, as we only know a few words. So picking from the menu is a lucky dip. You look for the odd word that looks familiar. Pollo is chicken etc. At each meal I wonder if I will like what arrives. We have on a few occasions swapped meals to suit our tastes. Fortunately this has worked out OK! The unusual thing about Spanish food is the absence of vegetables. While eating we sent the children a text message. I do miss them. We decided to visit Madrid today. We were going to drive to the outskirts and then get the metro but inadvertently managed to drive into the centre. We walked through the Plaza De Mayor and various other streets. How long do you plan on just sitting here then? So, we drove to Aranjuez which is about 10 miles from Chinchón. Aranjuez as we were about to discover, is the site of the spring palace for the Spanish royalty. 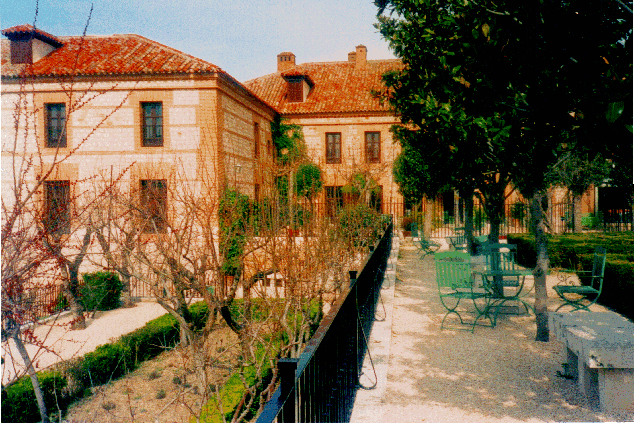 The palace is attached to an enormous gated garden and local river. Some of the outbuildings are quite imposing. I especially liked the buildings that lined the courtyard areas. Unlike English royal palaces, the grounds are open to the public. It is quite wrong that one of the largest green space in London is closed to the people who pay for its upkeep. The tour inside the palace was modestly priced and not crowded. The tour was interesting. It was mostly around art and artefacts, I would have liked a little history about the palace. The royal room were ostentatious in the extreme. I did like the Moorish room. It was fabulous, especially the raised domed ceiling. I disliked the acclaimed porcelain room. By the end of the tour, we were tired and hungry. Aside from a meal and tapas bar, that was that. Back to the hotel to start packing ready for tomorrow mornings flight.